There are some things that I wish Jesus hadn’t said or, at least, that I wish the evangelists had explained more fully when quoting him. John, chapter 12, verse 8a – ‘You always have the poor with you’ is one of those sayings. One of the things that my brother does to get me really annoyed is to quote this half-verse; and depending how I’m feeling I either respond by saying ‘that phrase needs to be read in context’, or by throwing something at him. Usually something soft, I hasten to add. Read out of context, it’s a dangerous verse! Jesus was quoting from Deuteronomy, where the people of Israel are instructed: ‘Since there will never cease to be some in need on the earth, I therefore command you, “Open your hand to the poor and needy neighbour in your land.”’ In that context, it is advice on how we should respond to the poor – with open hands. In today’s context, in the story of the anointing of Jesus by Mary of Bethany, it has nothing to do with how to treat the poor and everything to do with the new thing that God is about to do in Jesus – the extravagant love of God that will be seen in Jesus’ rapidly approaching death and resurrection. Each of the four gospels has a story of Jesus being anointed, and across the four we’re told three different versions. It’s a pity that we often collate them, because we then end up by labelling poor Mary of Bethany as a notorious sinner and there’s nothing to suggest that she was! We also miss the nuances of what each gospel writer is telling us. The story of the anointing according to Luke comes early in his Gospel, when Jesus is in the house of a Pharisee called Simon. 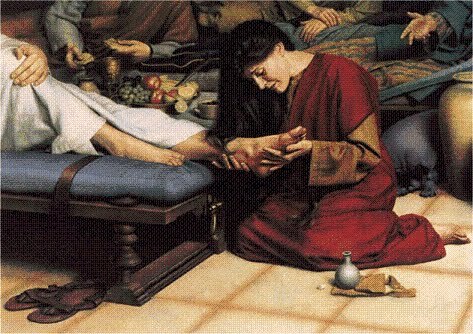 A woman of the city, a sinner, washes Jesus’ feet with her tears, dries them with her hair, and anoints them with ointment. Simon is horrified, and thinks to himself that if Jesus truly was a prophet he would know what sort of woman this was and not allow her to touch him. But Jesus points out that the greater the sin forgiven, the greater the love the sinner feels for the one who forgives: ‘I tell you, her sins, which were many, have been forgiven; hence she has shown great love. But the one to whom little is forgiven, loves little.’ Luke’s story of the anointing is about God’s forgiveness of sins. Mark and Matthew both tell the story of an anointing that happens in Jesus’ last week, in the house of Simon the Leper. An unnamed woman anoints Jesus’ head, proclaiming his kingship, and some of those around complain about the waste. But Jesus says, ‘Let her alone; why do you trouble her? She has performed a good service for me. For you always have the poor with you, and you can show kindness to them whenever you wish; but you will not always have me. She has done what she could; she has anointed my body beforehand for its burial. Truly I tell you, wherever the good news is proclaimed in the whole world, what she has done will be told in remembrance of her’. And what she did is told in remembrance of her, but sadly we’re never told her name. Then we have today’s story, the anointing as told by John. Like Luke’s story, it’s an anointing of Jesus’ feet rather than his head. Like Mark and Matthew’s story, it occurs in Jesus’ last week, and is connected with his death. So, what is it that John in particular wants us to hear in this story? Jesus is in Bethany, the home of Lazarus. In the chapter before this, we’re told about Jesus raising Lazarus from the dead; which led many Jews to believe in him, and had the Council worrying: ‘If we let him go on like this, everyone will believe in him, and the Romans will come and destroy both our holy place and our nation.’ They decided that it would be better to have one man die for the people than to have the whole nation destroyed, and from that day on they plotted to kill Jesus. As Jesus and his disciples enjoy dinner in the house of Lazarus, death is approaching. But only Mary of Bethany responds to its approach. Lazarus and both his sisters, Martha and Mary, act as disciples here. Martha serves, she literally ‘deacons’, and Lazarus sits at the table with Jesus and his other disciples. But it’s Mary who best models what it means to be a disciple of Jesus. She takes a pound of costly perfume, anoints Jesus’ feet, and wipes them with her hair. She offers Jesus her wealth; the perfume was worth about a year’s wages. She offers him her honour; unbinding her hair in the presence of men and touching Jesus’ feet. Later, on the last night of his life, Jesus will wash his disciples’ feet and tell them, ‘if I, your Lord and Teacher, have washed your feet, you also ought to wash one another’s feet. For I have set you an example, that you also should do as I have done to you.’ Washing each other’s feet is a sign of the love that the disciples are to show for each other. Mary is already able to show this love, withholding nothing of herself from Jesus. The house is filled with the fragrance of the perfume she offers; filled with the love she is showing. Mary’s anointing is not just a sign of love. Jesus’ hour is looming. Here, while Jesus is having a meal with his friends, he’s also being prepared for his burial. The other disciples may be unaware of how close Jesus is to his death, or in denial about what going to Jerusalem will mean, but in her anointing of his feet Mary recognises it and acts prophetically. This isn’t a royal anointing of Jesus’ head. People didn’t anoint the feet of a living person, but they could anoint the feet of the dead as part of the ritual of preparing a body for burial. In less than a week, the man who is now sitting and eating with disciples and friends will be dying on a cross. The two meanings of the anointing, the prophecy of Jesus’ death and the modelling of overwhelming love, are intertwined. After Mary anoints Jesus, Judas Iscariot asks, ‘Why was this perfume not sold for three hundred denarii and the money given to the poor?’ Jesus told the rich young ruler to sell all he had and give the money to the poor, which is exactly what Judas is suggesting. His complaint seems to be based on the good news for the poor that Jesus came to bring. So why is he wrong? John says that Judas’ supposed concern for the poor is hypocritical – he just wants to steal from the disciples’ common purse. But even if Judas was sincere in his objection, as the objectors seem to be in the stories of Mark and Matthew, he’s missed the point. ‘You always have the poor with you, but you do not always have me,’ Jesus says. There is always an opportunity to care for the poor, and that will always be an important part of following Jesus. But, here, at this moment, God is doing something unique, something that has never been done before and will never be done again. God is incarnate in Jesus, and the incarnate Word is going to die out of love for the world. For one brief moment God is present among humans as a human being, and this God will die a human death. God is doing a new thing, but Judas and the other disciples do not perceive it as it springs forth. Mary of Bethany does, and she offers her wealth and her honour and her dignity and her love and pours them all out over Jesus’ feet. In the same way, Jesus will pour out his own life, his own honour and dignity, dying a scandalous death. This death will be a sign of God’s love. Like Mary’s perfume, God’s love is not something to be protected and admired. It’s to be poured out, emptied to the last drop, until its fragrance fills the house. This is God’s love, shown in Jesus’ death, given for the sake of the world. We’re in the second last Sunday of Lent. Next week, we’ll celebrate Jesus’ entry into Jerusalem surrounded by cheering crowds. All too soon the cheers will turn to calls for his death, and we’ll spend Holy Week remembering betrayal and isolation and torture. But the story doesn’t end there. Mary is able to pour out her entire bottle of perfume without regret, knowing that it’s only a drop compared to the love of God she sees in Jesus. We’ll see that love too, not only in Jesus’ death, but in his resurrection. Like Mary, we can offer everything we have to God, because we know that ultimately the story has a happy ending. Amen. This entry was posted in Sermons and tagged 17/03/13, Lent, Sermon, Year of Luke. Bookmark the permalink.